In a small bowl, add in all of the dry seasonings and mix together. Set aside. Lightly brush olive oil over the fish, and season the fish with half of the seasoning. Repeat to the other fish fillets. 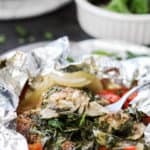 Take one sheet of foil, add one sheet of parchment to the center, add 1⁄2 tablespoon of olive oil to the center of parchment sheet. Top with half of the onions and half of the red peppers. Add in the fish and top with a squeeze of lime juice and half of the cilantro. Repeat the same process with the other fish and sheets. With the remaining sheet, top the fish and line the foil corners together. Taking one side at a time, fold the ends 2 times to make and envelope out of it. Continue with the remaining three corners to seal and create a packet with some air in the center. Do not poke. Repeat with the other fish to create the same packet. Place packets onto a baking sheet and bake for 17-20 minutes. Serve warm. Depending on the size of your fish, you may have to cut the fish in half in order to fit into the packet.